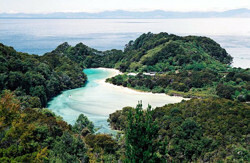 Dusky Sound is the place where the crew of captain Cook first disembarked in New Zealand. Today you can either reach it by sea or by an eight day tramp that traverses two passes above the bush line but mostly leads through rainforest. And mud. It is rather rough and that means only few people ever go there and so it is just what we were looking for. Mt. Aspiring National Park is quite different from Fjordland, even though they are so close to each other. 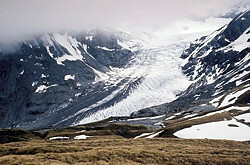 Unlike Fjordland, this park features wide glacial valleys with grassy flats, higher mountains and real glaciers. And Mt. Aspiring, the Matterhorn of the south, itself. 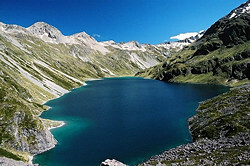 We did the Cascade Saddle Route and it was one of the nicest places I have seen in New Zealand. West Coast is the name of a quite narrow but fairly long strip of land near the Tasman Sea which is renowned for extremely bad weather and low population density. My pictures from West Coast come from two different trips. Some were taken in Copland Valley where we went to relax in a hot spring, and the rest on the Inland Pack Track which is known for numerous river fords. Arthur's Pass National Park is a place of high mountains, scree slopes and wild rivers passing both steep gorges and wide valleys. And unpredictable weather which together with safety concerns made us to give up a tramp. I was passing the pass again approximately two weeks later and have managed to climb Avalanche Peak. 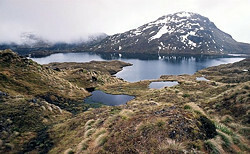 Nelson Lakes National Park features not only marvelous lakes and beautiful peaks stretching up more than two thousand meters but also usually good weather. After all the rain and fog before, a whole week of sun and blue skies certainly made me enjoy the surroundings even more. 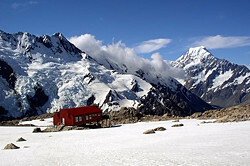 People visit Mount Cook National Park to see the Mt. 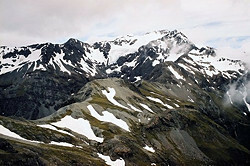 Cook, the highest mountain of New Zealand, and to leave quite disappointed because the weather prevented them from seeing anything. Fortunately, after one really ugly day I had a couple of truly awesome ones and so I enjoyed walking on the Tasman Glacier and climbing up to Mueller Hut very much. Abel Tasman Coastal Track is the busiest walk in the country, there are loads of sea kayakers and the worst people come to camp by water taxis. The exception is the northern (last) part of the track where walkers don't go because most of them have had enough, water taxis don't operate and sea kayaking is prohibited. That is a nice lonely place with seals and other wildlife. The South Island is rightly considered far more attractive for trampers. 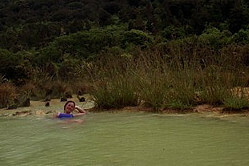 However, there is at least one place on the North Island that one should not miss and that is the volcanic Tongariro National Park. 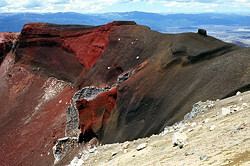 The park boasts the greatest one day walk in the country, the Tongariro Crossing, and it might as well be true. I have some more pictures of the Northern Island. The first two are of the Mt. Taranaki volcano which I did not climb because of the weather. 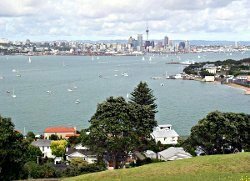 Then there are some photos of various "geothermal parks" around the lake Taupo and I conclude with images of Auckland, a beautiful city where I also concluded my journey around New Zealand.